Not the book cover picture, but this one does capture Wayne’s innate likability. Simon & Schuster, 574 pp. Someone long ago once wrote that biographers generally fall into two camps in that they either come to love or despise their subject. 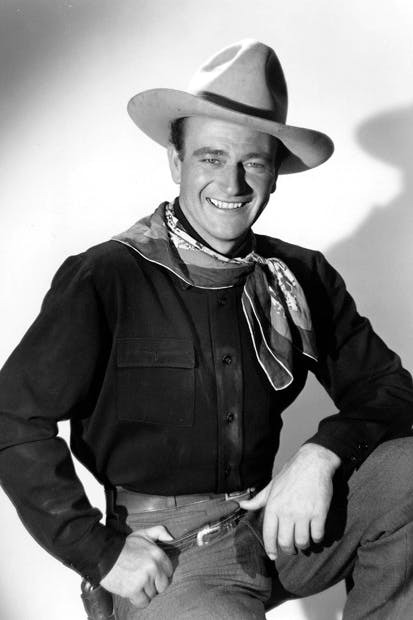 Scott Eyman falls firmly into the first category with his lengthy effort at a comprehensive biography of John Wayne, consummate Western actor and the biggest luminary of Old Hollywood, remembered and watched long after his many competitors have faded into history, and still a political lightning rod for his outspoken reactionary views. Due to his involvement in the political controversies of post-WWII America, particularly the Red Scare in Hollywood, Americans’ reactions to Wayne remain deeply polarized, with estimates of his acting talent often being directly dependent upon ideological orientation. As with a lot of other right wing actors and directors, e.g., Barbara Stanwyck, Robert Taylor, and DeMille, the spectator has to set aside personal bias and decide whether a particular film works as art. That is, is the film a good example of what can be done in the medium? While many slag Wayne’s acting ability, it’s still my opinion that he gave many fine performances with examples ranging from famous works like The Quiet Man and The Searchers to more obscure ones like The Long Voyage Home, where he played a shy, tongue tied Swedish sailor. All three of these films were directed by John Ford. Although Ford is often characterized as Wayne’s Svengali, it’s also true that other directors like Howard Hawks and William Wyler also got good performances from Wayne. Eyman does a good job of describing Wayne’s early home life, a mother indifferent to him to the point of hatred, a loving, but ineffectual father who could never make a living, and a miserable life as a small boy on a barren farm in Death Valley. This upbringing spurred Wayne with a lifelong determination to succeed that he combined with good looks, inherent athleticism, and unmissed opportunities to become one of the biggest stars of Old Hollywood. Eyman also ably summarizes Wayne’s years on Poverty Row, a decade of grinding out six reel, zero budget oaters, risking his neck every day for up to sixteen hours at a stretch for scant wages and dubious film star fame. B Western movie fans will enjoy this discussion, learning about such obscure terms as the “dog heavy” (the number two villain in the film, usually introduced by having him kick or shoot a dog). Of all the B Western movie actors, only Wayne broke as big as he did, again a tribute to his talent, determination, and luck. Eyman discounts a number of myths that have evolved around Wayne. No, he didn’t like horses (once famously declaring he had to be paid to be around them), a hangover from his childhood on a farm. He also didn’t like being outdoors, his preferred method of relaxation being to go out on a boat where he could fish, play chess or cards, and most importantly, drink himself silly. 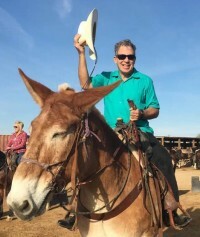 Wayne was a major drinker and Eyman doesn’t minimize any of that or other failings like womanizing and bad marriages (Wayne’s second and third marriages to Chata and Pilar respectively were both failures). Where Eyman does tend to minimize the unfortunate aspect of Wayne’s personality and to instead emphasize the good part is his steady emphasis on the actor’s likability, on his very American qualities of being open, friendly, and willing to accept people. While it is true that Wayne was often generous to friends and family, it still remains the case that he played an active, hostile role in the Red Scare, naming people in the film community that he considered politically tainted and threatening them with the loss of their livelihoods or worse, even prison, if they didn’t inform on others. Although nowhere near as malign during this period as his drinking buddy, Ward Bond, Wayne still was an important part of the well orchestrated, led, and financed drive against the left wing in Hollywood. Eyman basically passes over this as quickly as possible. Another negative trait Eyman pretty much ignores was Wayne’s habit of needling people, a trick he seemed to have picked up from John Ford. Especially when he’d had a few, which was all the time, despite being a likable guy in many ways, Wayne enjoyed getting under other people’s skins. To close on a positive note, I think this biography does set the record straight that, despite his anti-intellectual posturing, Wayne was no dummy. Capable of quoting Milton or Keats, the actor had an extensive library, with one of his favorite authors surprisingly turning out to be J. R. R. Tolkien! Eyman also highlights Wayne’s lively sense of humor (Wayne and Red Buttons are playing chess on location in Africa when a leopard walks into the clearing. “There’s a leopard behind you, Duke,” Buttons says. “See what it wants, Buttons,” Wayne replies.) One of the bio’s most fascinating aspects to me were the various film roles offered Wayne that he turned down (film buffs love to play “what if”). I can see why Wayne declined Blazing Saddles and Dr. Strangelove, juicy as those parts would have been, but I think it’s a downright rotten shame he never did a proposed film with Clint Eastwood called The Hostiles. That would have been a potentially very interesting encounter between two Western greats. I recommend this book to all Western movie fans, Old Hollywood buffs, and students of American pop history.